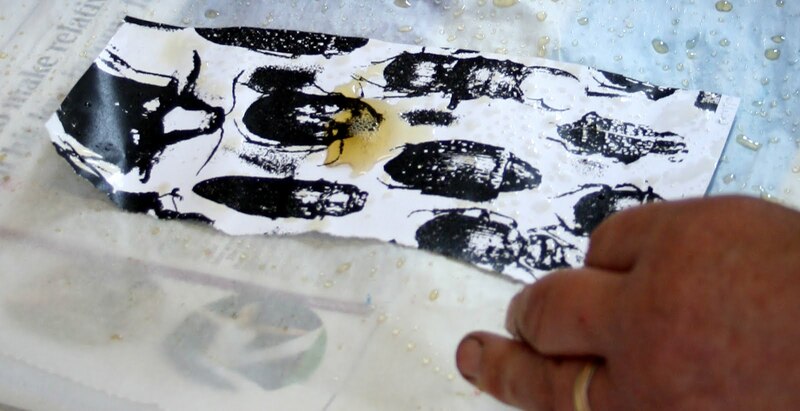 I have mentioned gum arabic transfer in previous posts, it is a technique I use a great deal to start off sketch book pages and allows me to place a photographic element into my compositions. 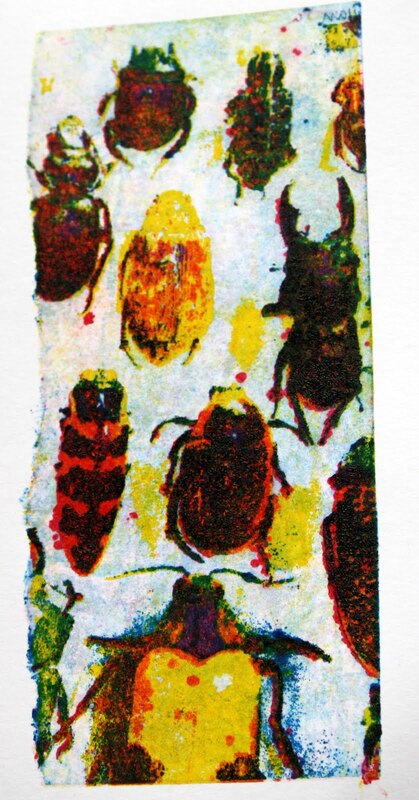 For some time I have been aware that it is possible to use gum arabic transfer as a colour separation print. So with this image as a starting point I had a play. First take your colour original and using photoshop produce a set of colour separations, yellow, magenta, cyan and black. My long suffering computer whizz of a friend Jane did this for me, for which I really thank her. These 4 copies must be in a contrasting black and white and printed using a toner copier...not ink jet. Have them photocopied. Cut your images so that you have a registration corner where they will all match, mine is bottom left which will turn into bottom right when I print. 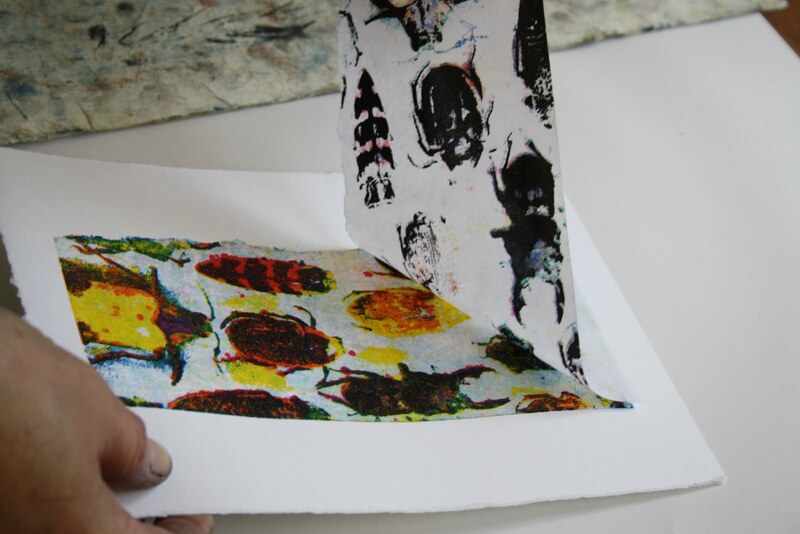 Set up your colours, I am using oil based etching ink from Intaglio Printmakers in Magenta, Process Yellow, Cyan Blue and Black. 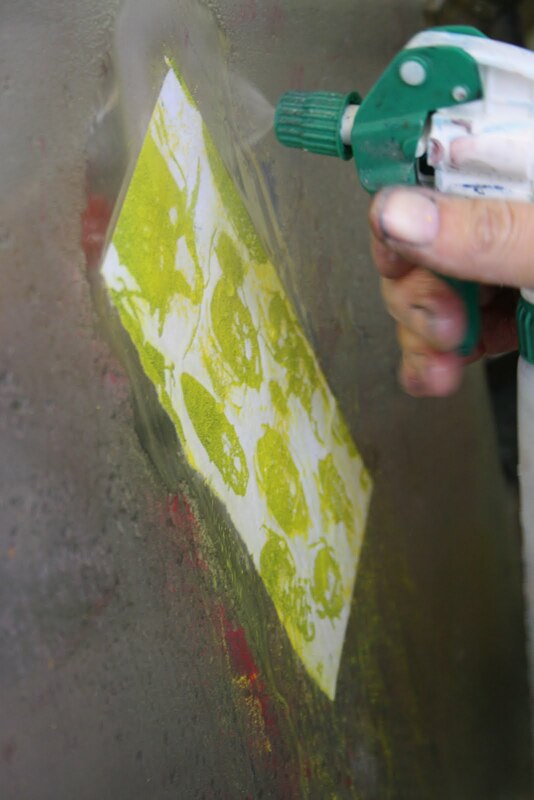 Add a small amount of linseed oil to the ink to slacken it off. 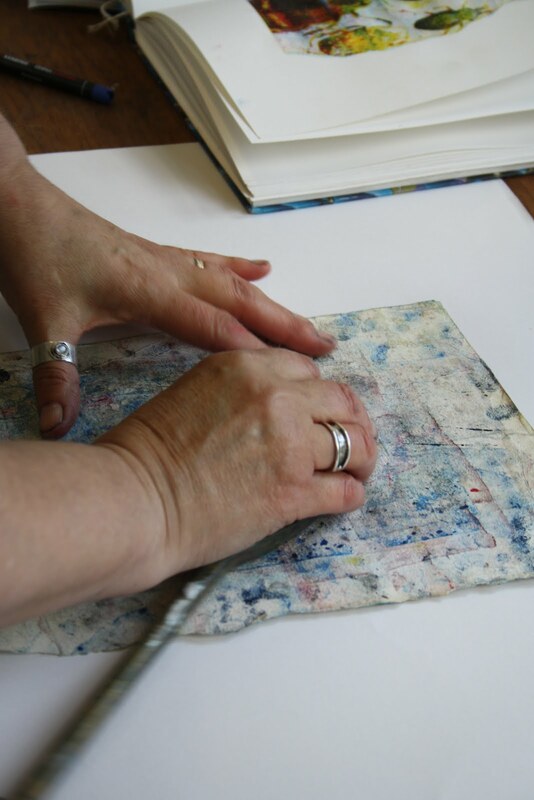 Lay your yellow copy on a piece of baking parchment and cover the back then the front liberally with gum arabic. I get mine from Hawthorn Inks. Place copy image side up on a magazine as it will stick to newspaper and you can reuse the parchment to gum another copy. Roll the ink in thin layers all over the copy. Take inked copy to the sink, I always place it on a piece of perspex at this point and spray with a plant spray bottle until most of the ink has shed off the white areas. The water will dissolve the gum arabic taking the ink with it and the greasey toner marks will hang on to the ink. You are now ready to print. Place the yellow copy down first, I use Snowdon Cartridge paper, 300gms, anything thinner makes the receiving surface buckle with the wetness. Place a sheet of blotting paper on top and rub with a wooden spoon. Repeat this process with the red, blue and lastly the black copies matching your registration corners. 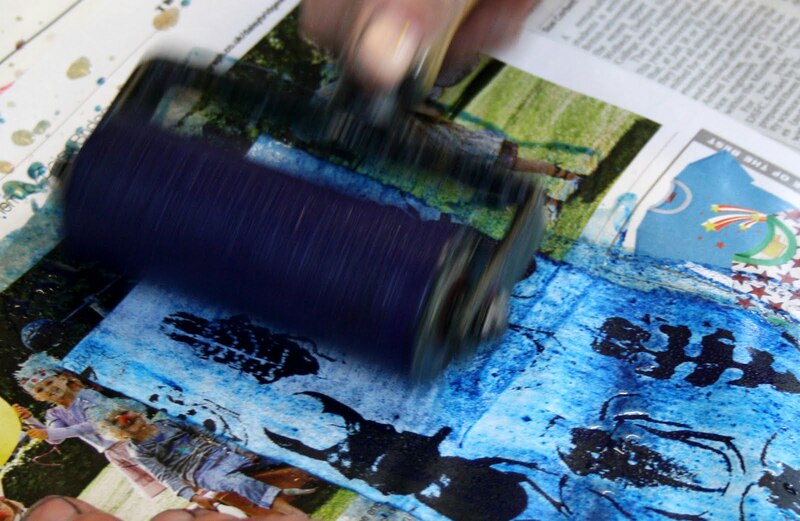 The ink releases onto the paper. I quite like the inaccuracy of the registration. If I had wanted the look of the original image I would have just printed it out. I intend to try a print using a different set of reds, yellows and blues. Have some fun with it, experimenting is very rewarding. This post would not have been possible without the technical support of my friend Jane and the photographic skills of my son Toby. Thankyou to you both. That is a lengthy process, but the result has a unique quality. I love the relative accuracy of the black print over the much looser shapes of the other colours. Thanks for sharing the technique, but I think I'll leave it to you! Thanks for this post. I've used colour separations in screen printing but not very successfully so far (either too precise or not precise enough!) and obviously in digital printing. This looks good to combine with monotype or even with painting. I'm looking forward to experimenting with it. 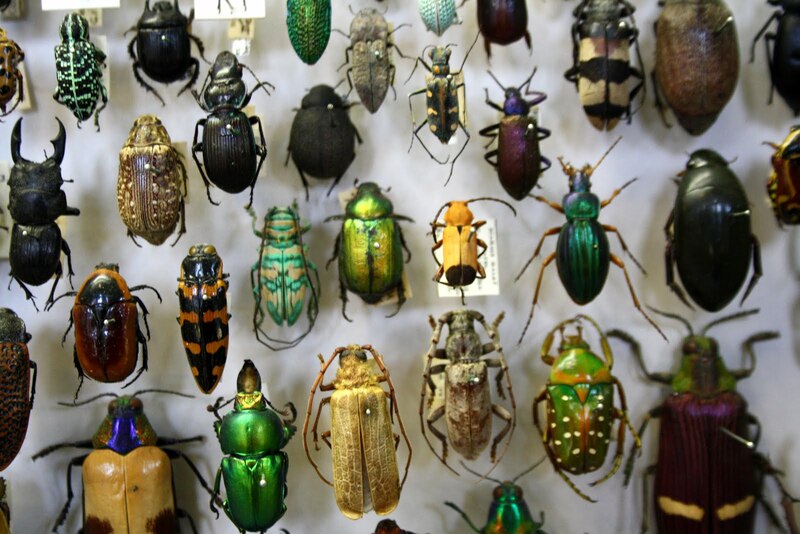 A thought for your future experiments - working digitally I have combined separations in a different order - cyan for yellow etc and even used separations from different images, or different versions of the same image. Doing this with these transfers would be time consuming but might yield some interesting results. Searching for how to do this process again as its been years since I last had a go. This was the 1st match on google. Glad to still be learning from the best. Dan McCatty. so you spray, instead of wipe. Absolutely brilliant. I cannot wait to try this. this looks like fun so I thought to give it a try. 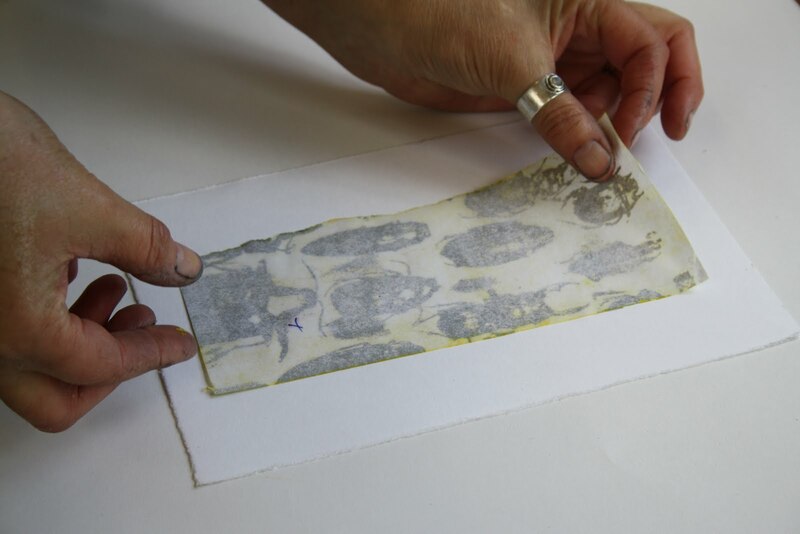 I am not sure about one part of the process though, do you roll the sheets that you've just covered in gum arabic with ink, without letting the gum dry? Or do you let it dry first? 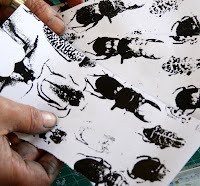 Do you think this will work with printing press ink as well as with etching ink (I think etching ink is a bit tougher?). Thanks for sharing the technique, in any case! I am an artist using vitreous enamel and printmaking to tell stories. Thankyou for stopping by but please respect the copyright of my work. the yard:ARTspace. For workshops and courses.